The last couple of days have been a bit grey and dreich as we call it in Scotland, not very inviting to go outside. But this morning dawned bright, clear and sunny, a perfect day for a hike and a picnic. As we haven’t been up to Humac in some time, we thought we’d head up there. 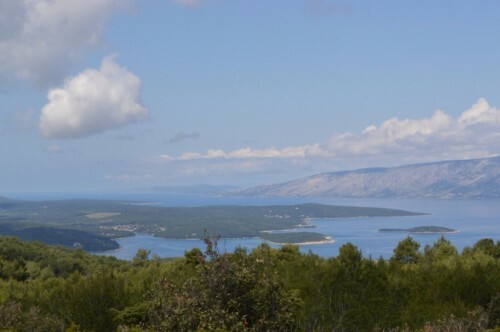 It’s a beautiful drive up, with views back down to Vrboska and Mudri Dolac on the coast, and the neighbouring island of Brač off to the right. The road has been partly upgraded over the winter, and now has several stopping places and even a viewpoint car park. Amazing! Humac is a seasonal village, meaning that for the past several centuries, the people of Vrisnik would go there in the summer to graze animals and tend fields. 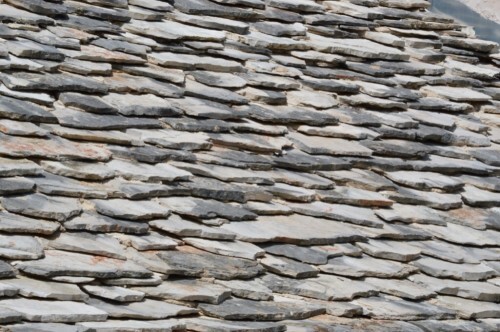 The houses are built from local stone, there’s plenty of that available. 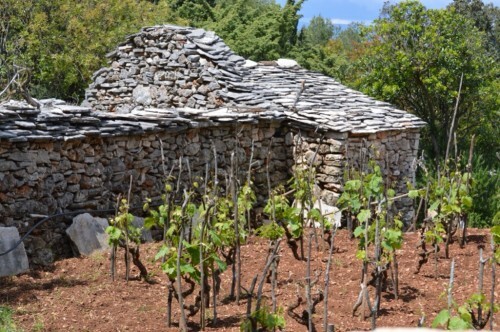 Even the roofs are stone, though there are some renovations beginning to appear in red tile. 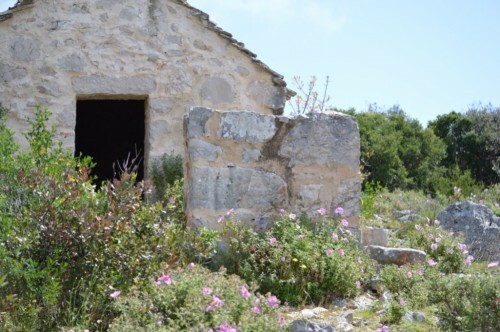 The main part of the village dates from the 17th century, though it was originally established in the 13th century. 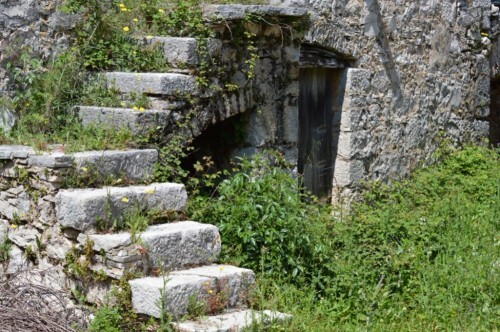 It’s a fascinating place to wander around, largely deserted as it is, like a snapshot of an older time. And in springtime it’s beautifully carpeted with wild flowers. 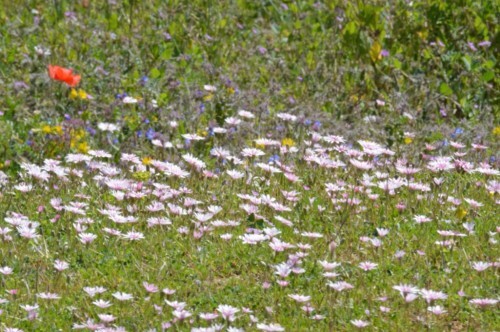 Who needs a garden when you have wild flowers like these? There were tiny blue and pink flowers everywhere, clumps of blue salvia, bright splashes of pink, and creamy white and yellow rock roses, not to mention red poppies, and a whole host of others I don’t know the names of. 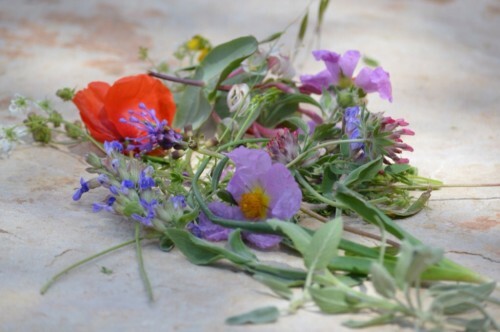 When I was little, Mum and I used to collect wild flowers on our walks, and press them in a book. These days it doesn’t seem reasonable to be helping yourself to flowers from beside the path, especially as the bees were busy working them! 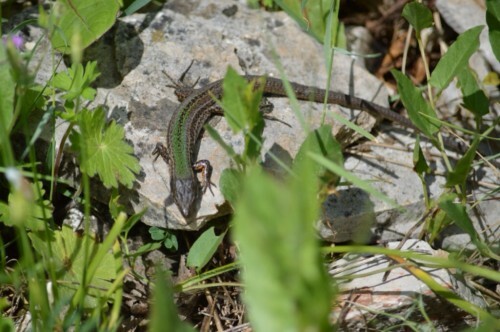 As well as the busy bees, we saw a couple of lizards with green backs sunning themselves in a quiet corner. 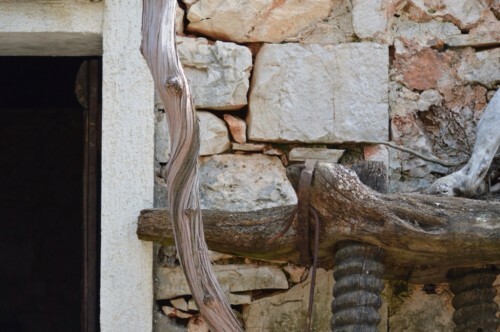 A small snake beside the path removed itself into the recesses of the wall as we passed – too quick to be photographed. 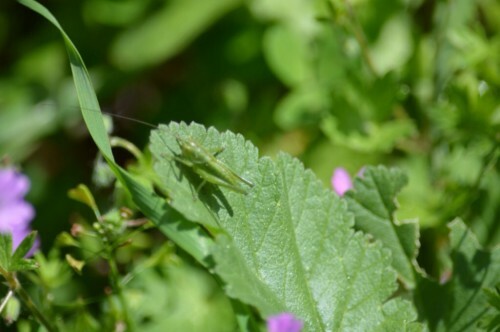 This small grasshopper waited around to pose,though! 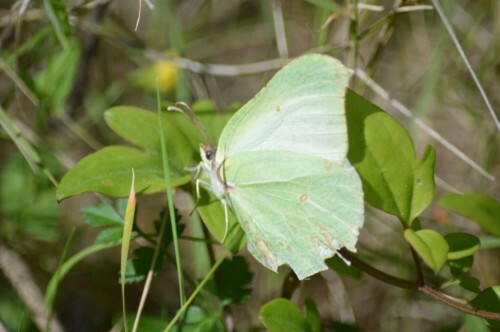 Floating butterflies in yellow and black – this must be a good time for them, too. Up at the nearby panoramic viewpoint (no telescope) the views are almost 360 degrees including south to Korčula and Pelješac, west to Vis and maybe in optimum conditions, Italy in the far distance. I can almost imagine it there, a hazy dark band under the far clouds. We sit and enjoy the peace and the scenery for a while. Back in Humac, the konoba is now open and serving drinks. Excellent! 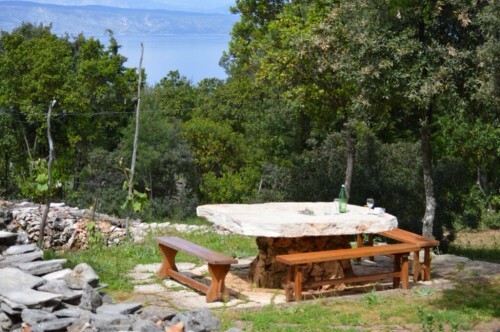 We settle down at one of the massive stone tables overlooking the view. One of the previous occupants, possibly a child, has left a bunch of wild flowers lying on the table. It’s a pretty addition to our picnic! We order a carafe of their white wine and confirm it’s OK that we brought our own picnic. Good idea, Keti says! 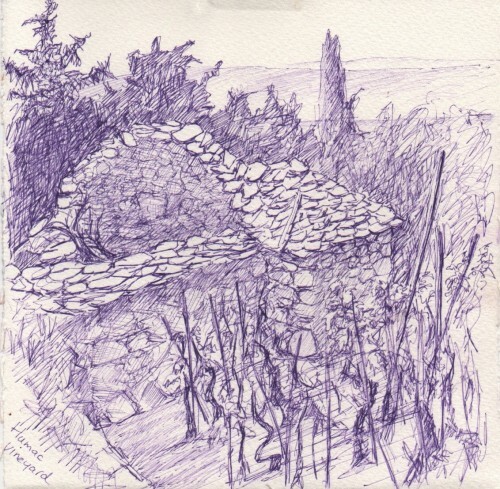 I settle down to sketch part of the view in front of me, an old stone building and vineyard. The building, of course, turns out to be the toilet, but has so much more style than most! Konoba Humac is open in the summer months for dinner, or by special arrangement out of season. 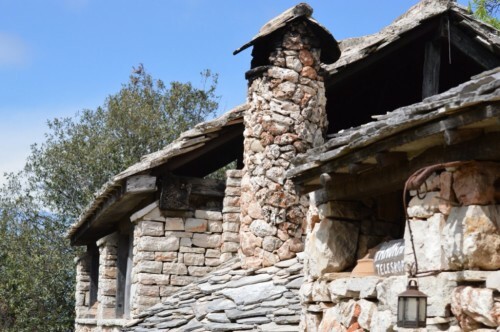 The food is excellent – Jakov and Keti grow their own fruit and vegetables, olives and vines, all ecologically done. Meat and fish cooked on the grill is wonderful, including the traditional peka, if ordered in advance. Highly recommended for an evening out. The location is wonderful, absolutely spectacular. 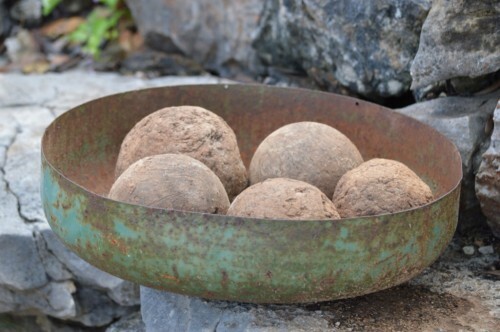 Fancy a game of balota? I see also that they have a bowling alley, complete with an assortment of wooden balls that must give a certain random element to any game. Very tempted to give it a go, as my game can always be improved by random acts of a swerving ball! My sketch features what turned out to be the toilet block! Great! Was just uploading flowers for my new post (coming up on Sunday or so)! The wild flowers are so pretty at this time of year!